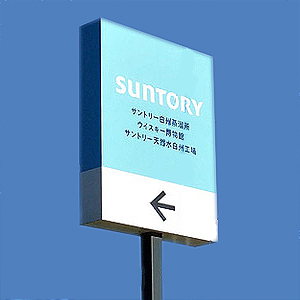 A Distillery of a nation-wide famous Whisky, Suntory is only 10 minutes from Michi-no-Eki ‘HAKUSHU’, heading towards north (the opposite direction to Daigahara area) on National route 20, you will find a light blue signboard of Suntory. Turn left here and you will get to the Distillery. In the 820 thousand square meters (510 square miles) premises, there are distilleries, cellers, Whisky Museum, shops, restaurant and bar. 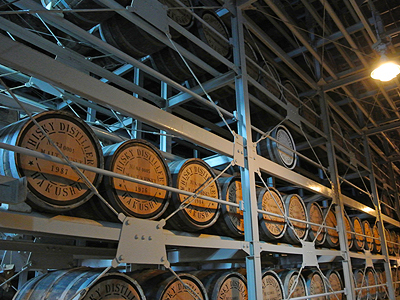 Even if you don’t drink, or prefer wine or other alcohols, it is strongly recommended to experience a guided tour in a distillery for your curiosity. The guided tour is given by a beautiful young girl only in Japanese but audio guidances in English, French and Chinese are available for your necessity. For instance, we prefer wine at the table and didn’t have any interest in whisky but after we tasted “Hakushu” – the whisky Suntory distills here, with soda made with water of Hakushu, ordering whisky next time when we go out for dinner were added to our choice of drink when dining. We found that we had a prejudice… we had never tried whisky before… until we visited and took a tour here! 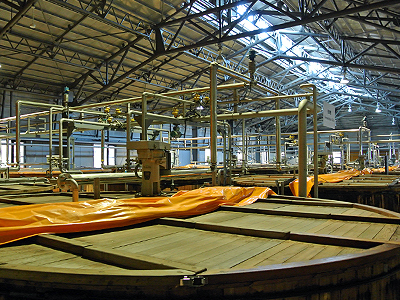 In a guided tour through distillery you can, of course, see how whisky is made, feel it with all your five senses; the scent of barrels, barley, ferment and alcohol. You can feel the temperature and the air…. just like the unaged-whisky in the oak casks. When we were in Italy, we went to visit many wineries and got very familiar with how to make wine. We have also been to Balsamic vinegar makers. Through these experiences, we now know the differences among wine, Balsamic vinegar and whisky making though they all have some similarities. At the end of the guided tour, you can enjoy the tasting (the experience with fifth sense) and will be taught the best ways to drink their whisky made with good water of Hakushu! In the museum, you can see some antique devices of whisky making, like big old barrels, which are very interesting to see and remind you of the medieval alchemists. 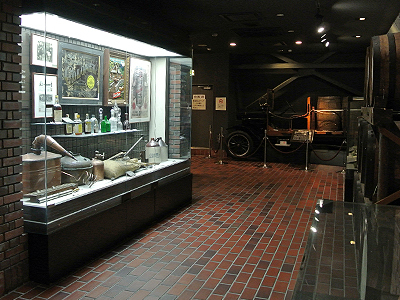 The most interesting parts of this museum we thought was the area showing the history of whisky making in Japan. You may all know what whisky is. Whisky is a distilled alcoholic beverage made from fermented barley aged in wooden barrels. Distillation is said to have been practiced for the first time by the Babylonians in Mesopotamia in the 2 centuries BC or by Greeks in Alexandria in 3rd century AD. But these were not distillations of alcohol but said to be essence of plants used in medical treatments. 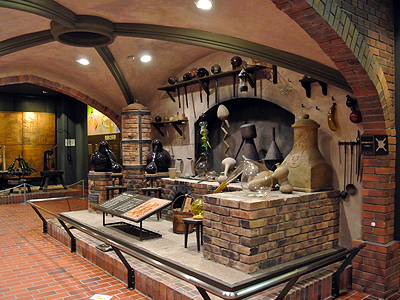 The techniques of distillations were passed onto the medieval Arabs and Latin, and the earliest records of distillation of alcohol were in the 13th century in Italy, which was distilled wine. It was called ‘Aqua Vitae (life of water)’. ‘Aqua Vitae’ spread all over Europe by diplomatic agents, traders, monks and students from port cities like Genoa. It was brought to Scotland and Ireland where the word ‘whisky’ was born. (The origin of the word ‘whisky’ is from “Acqua Vite”, put into Gaelic words, “uisce beatha”. It was in 1923, five years after the end of World War I, that the founder of Suntory, Shinjiro Torii, built the first distillery in Japan in Yamazaki near Osaka with a help of Masataka Taketsuru who learned whisky making in Campbeltown, Scotland. It was only 70 years after the Black ships first arrived in Japan, the occasion when Japan was moved to open its gate to the world. Whisky ‘Hakushu’ deom Hakushu Distillery. Photo from Suntory Official Site. Suntory’s first successful whisky, “Kakubin”. Photo from Suntory Official Site. The first “Made in Japan” whisky was released in 1929 though it was too early for Suntory to make good quality whisky and this project was fallen in failure. However, they did not give up and continued on the improvement. In 1937, after 14 years from the opening of distillery, Suntory made a great success with “Suntory Whisky 12 years”, now more famous by the name of ‘Suntory Kakubin’ (squared bottle). You can find their beautiful company site here apart from the information site below. Worth looking! A view from the museum top. 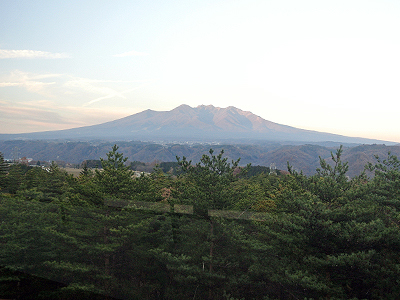 On the top of the museum building is an observatory where you can see splendid views of mountains around Hakushu. Don’t forget to go upstairs! From 9th December to the middle of April 2014, the museum will be closed for renovations. Wait for the renewal opening! The guided tour and a tasting is complete free of charge. If you got familiar with Suntory whisky and liked it, why don’t you get some bottles for souvenirs? Address : 2913-1 Torihara, Hakushu-cho, Hokuto-shi, YAMANASHI Pref. 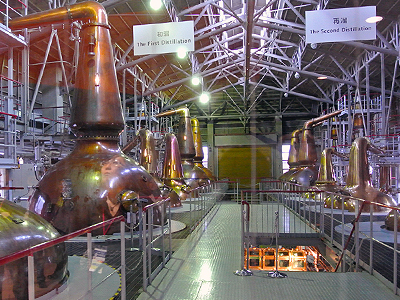 Tour Guides : Guided tours of the distillery are conducted in Japanese, but audio guide in English, Chinese and French is available. Please request a unit when making your reservation. ** Guided tours should be reserved at least one day before by a telephone.